Although Ecuador is most famous for its Galapagos Islands, there are many fascinating attractions on the mainland that are worth visiting. 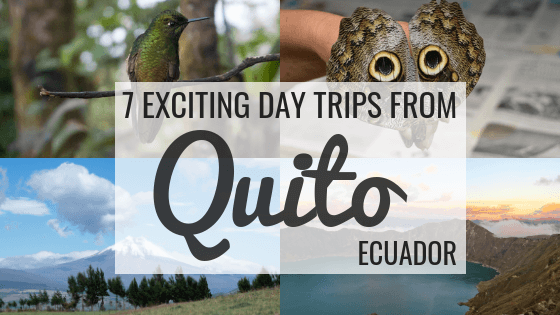 I highly recommend spending some time in Quito so that you can take some day trips and discover Ecuador’s breathtaking nature and interesting culture. The most popular day trip from Quito is La Mitad del Mundo, which means “the middle of the world”. It was designated the official equator line by the 18th Century geographer Charles-Marie de La Condamine. Even though since then, with the help of GPS, the real location of the equator has been found to be 300m to the north, La Mitad del Mundo is still considered a fun day trip from Quito. The 30m high monument has a yellow line in front of it where you can stand with one foot in the northern hemisphere and one foot in the southern hemisphere and have your photo taken. You can pay $3 to go to the top of the monument and enjoy a view of the area. Near the monument are souvenir shops, restaurants, and exhibits. If you want to visit the real equator line, there is a small museum called the Inti Nan Solar Museum nearby. I took this tour to La Mitad del Mundo. The tour is run by the same company that does the Quito Hop-On Hop-Off bus tour. The first stop on the tour was the Pululahua Volcano Crater Lookout, which has amazing views of the surrounding countryside. Next, I visited the Middle of the World Tourist Complex, which houses different exhibits about local culture and history. You can see replicas of traditional native homes. At the Plaza del Cacao, you will learn about the chocolate-making process and even sample some raw chocolate. You can also try a famous experiment where you balance an egg on a nail to show the power of the equator. About 2-3 hours away from Quito is Otavalo Market, the largest and most famous outdoor market in South America. It is known for its traditional handmade souvenirs and textiles. It is the perfect place to stock up on souvenirs and gifts for family & friends. You are allowed to haggle at the market, so if you know your numbers in Spanish that will come in very handy! Remember to bring small bills and coins as vendors may not have enough change. The best days to visit Otavalo Market are Saturday or Wednesday when it is at its biggest. You can get there by taking a direct bus from Quito’s north terminal or by taking a day tour. On Saturdays from 6am to noon there is also a livestock market nearby where you can see many animals like pigs, cows, horses, chickens, dogs, cats, and rabbits for sale. Only an hour’s drive from Quito is the Termas de Papallacta, a beautiful resort high in the mountains with dozens of hot pools and a spa. The name Papallacta comes from the words papa (potato) and llacta (town). The town of a Papallacta is a potato farming town. However, today it is known for its hot springs. The hot pools have different water temperatures, from steaming hot to freezing cold. Some pools are as big as swimming pools while others are small and secluded. You can get to Papallacta by taxi or organized tour. This tour costs $60 and includes entry to the spa, a locker and a towel. If you go without a tour, the entry fee is $23 for adults. Towels cost $1 with a $5 deposit. If you don’t want to rent a locker, you will be given a large wicker basket that you can put your stuff in and place next to the pool while you relax. Before you relax in the hot springs, you might like to take a short walk along the La Isla nature trail to discover the flora and fauna of Papallacta and see a small waterfall. You can have lunch at either the Kiosco Snack Bar which sells snacks like hot dogs or the Pumamaki Restaurant. At the Pumamaki Restaurant, there are some set menus you can order from that include soup, a main course, a drink and a dessert. The trout is the most famous dish. For nature lovers, Mindo cloud forest is only a couple of hours from Quito. It is famous for its wide range of species of birds, orchids, and butterflies. Day tours to Mindo include a visit to the butterfly farm followed by a nature walk to see waterfalls. You will also see amazing hummingbirds. After that you can choose from several exciting activities including tubing, zip lining or visiting a chocolate factory. The temperature in Mindo fluctuates between 15ºC – 24ºC but you will need a raincoat in case it rains. Less than a 2-hour drive from Quito is the enchanting Bellavista Cloud Forest Reserve & Lodge. It’s a great place to escape the city and immerse yourself in nature. It is a bird watcher’s paradise. The main attraction at Bellavista Cloud Forest Reserve are the hummingbirds that congregate near the bird feeders. A day trip to Bellavista Cloud Forest Reserve starts at $129 for one person (it costs less if you are a group of 2 or more) and includes round-trip transportation, breakfast, lunch and a guided hike. Your day trip will start early with pick-up around 6:30 am. During your journey to the lodge you will see fabulous views as you drive along the mountain road. Once you reach the lodge, you will enjoy breakfast in a cozy dining room before going on a 2-2.5 hour hike with a naturalist guide. During the hike you will learn about the interesting plants in the forest and try to spot birds. Bellavista Cloud Forest is one of the few places in the world where you can see the Plate-billed Mountain Toucan so keep an eye out for it during your hike! After your hike, you will have time to eat lunch and watch the hummingbirds before catching the shuttle van back to Quito at 3pm. Cotopaxi Volcano is the 2nd largest active volcano in the world. It is also the 2nd most visited National Park in Ecuador after the Galapagos. You can take a tour from Quito to Cotopaxi which includes a hike up to the Jose Ribas shelter at 4800m and then a hike to the glacier at 5000m. Later, you will stop at Limpiopungo lagoon at 3800m. The hiking tour will last about 4 hours. Since you will be hiking to a high altitude, wait at least two days before taking this day trip from Quito to allow your body time to adjust to the altitude. Wear warm clothes, a waterproof coat and bring plenty of water. Another tour option is a combo hiking and biking tour. You will hike to the Jose Ribas refuge and then after returning to the parking lot, bike to Limpiopungo lagoon. If you’re not interested in hiking or biking, you can go for a horseback riding tour around Cotopaxi Volcano and the National Park. Quilotoa a beautiful bluish-green volcanic lake. The caldera was formed after an eruption more than 700 years ago. The lake has a slight greenish colour because of dissolved minerals. As there are no direct buses, the easiest way to get to Quilotoa is to take a day tour from Quito. Most tours have a similar itinerary. On your way to Quilotoa you will drive on a highway called the Avenue of the Volcanoes. You will stop at the town of Saquisili to visit markets and learn about Andean culture. The next stop is Quilotoa, where you will take a short hike down to the lake (about half an hour). You will have some time to admire the view from the shore, kayak, or even swim. The 1-2 hour hike back up can be slippery, sandy, and steep, so some people opt to hire a horse for $10. You can have lunch at the restaurant nearby. On your way back to Quito, you will visit a Tigua community. You will arrive back in Quito around 7pm. These are some great day trip suggestions! I have been to many of them while living in Quito, but not all. I would love to go to Quilotoa Lake. It looks gorgeous. Bellavista Cloud Forest Reserve looks great. Been to Otovalo and La Mitad del Mundo but none of the other places. Makes me want to go back. Thanks for those tips. I’ll be spending about two months in Ecuador later this year and it seems that Quito is a good home base for 2 – 3 weeks.